It's been hard not to fee like a musical dinosaur in recent months. Between our second Breeders show in the past couple years, Sonic Youth and, last night, Alice in Chains, it might seem like we're on a serious nostalgia trip with bands that were popular when the horrible crowd of people that now populates bars in Uptown was in diapers. For every one of these shows we go to, some might think we have to give back to the local music scene to retain any type of hipster cred (GO SEE BLACK BLONDIE AS OFTEN AS YOU CAN. Seriously. They are terrific). 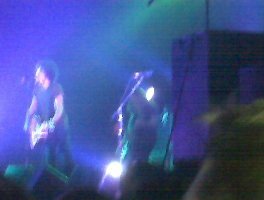 But as that blurry picture of last night's show clearly indicates -- the wobbly person-like object to the left is new singer William DuVall -- Alice in Chains still rocks. And we have a different viewpoint on aging acts and their fans. There was a time maybe 8-10 years ago when we would sneer at the idea of seeing Dokken or Ratt at some bygone county fairgrounds, or even REO Speedwagon filling a big arena. Just give it up already -- fans and musicians. There was a time and a place, a moment in the sun, but it's gone. Stop living in the past. When you're young, you think you're going to live forever; you also think that anybody past a certain age is no [redacted] good at anything anymore. You think the thing happening RIGHT NOW takes precendence over anything that's ever happened because that happens to be the thing you're into. As you get older, you realize it's just (X). It's just sports, it's just music, it's just life. If it's still good, enjoy it. Don't worry about who is supposed to be doing what, because that's not really how it works. You do what you want to do for as long as you can and as long as people will pay attention and enjoy it. If that means playing songs from 20 years ago, even without a key member of the band -- and really, if you are looking for a "how not to go out" manual, please look at Layne Staley's Wikipedia page -- then go ahead and do it, Jerry Cantrell. Because it still sounds good, and it still made a sold out First Avenue crowd -- some in flannel, some in black, some worn down by a generation worth of life more than others -- very happy to be there. (The RandBall Better Half was among the happiest, by the way. AIC was her favorite grunge band, which is to say was probably her favorite band for a long period of time. She also plays and sings a mean "Rooster" on the guitar, in case you were wondering). Do your thing, Jerry Cantrell. Do your thing, Brett Favre. If it still works, and we are still entertained, that's all that matters. Tuesday (Fantasy football -- how's it going?) edition: Wha' Happened?